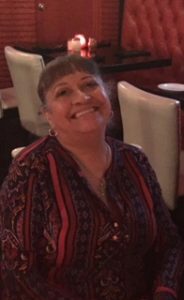 For this employee spotlight, we spoke to Vickie Chavez. Vickie has been a member of the Campisi’s family for 42 years now. She is currently a manager at the Mockingbird location, some customers call it “The Egyptian”, and has been at that location since her first day! Her friend recommended she apply to Campisi’s and even though she didn’t know much about Italian food, she decided to do it. She had an interview with Joe Campisi on Valentine’s day of 1976 and he hired her on the spot! “I asked Mr. Campisi when do I come back to train?” Mr. Campisi responded with, “Train? You’re working tonight!” Vickie started as a waitress and took to the job right away. She became a manager 10 years ago but is more than willing to help out wherever she is needed. Vickie explained that when you are first hired, you have to learn all about the restaurant and the history behind it. Campisi’s is unique and as a waiter, you have to know more than just the menu. Customers frequently ask about the traditions and the history so it’s important for the staff to know about Campisi’s background. Vickie loves talking to people and connecting with the customers. She loves hearing everyone’s stories and really getting to know some of the regular customers who come in. She’s even been invited to sit down with a few of them for lunch! Hearing about different people’s traditions and their stories about coming to Campisi’s really make her day and make her job worth it. There have been customers who have been coming to Mockingbird’s location for years to the point where she has their special orders memorized. If their order gets taken off the menu, the staff will go out of their way to make it just the way they like it. If she had to pick her favorite dish off the menu, it would be the “all the way pizza”. “I could eat that every single day it’s so good.” For drinks, she would highly recommend either the Italian coffee or the Italian Margarita. She also likes to pair her food with either an ice-cold Dr. Pepper or a classic Miller Light. In her spare time, she enjoys bass fishing and relaxing out on Fork Lake. She loves spending time with her dogs and antiquing furniture. When asked why she loves working at Campisi’s, she explained that she refers to her coworkers as family and really cares about each and every team member. She thinks of the younger workers as her kids. Vickie is an incredible worker and we are so happy that she is a part of the Campisi’s family. Come and visit her at our Mockingbird location and brighten her day!